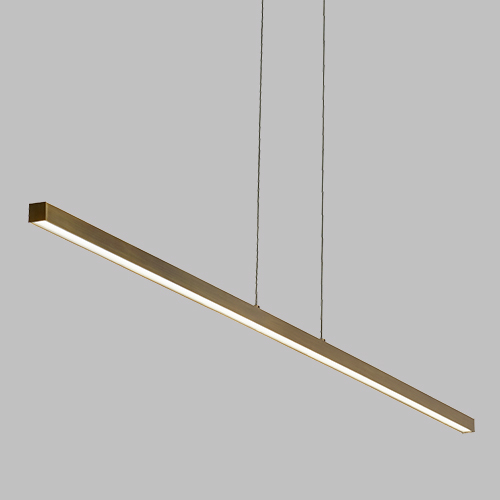 The ultimate in modern minimalism, the clean horizontal line of the Essence linear light chandelier by Tech Lighting will make a dramatic statement while not detracting from beautiful room surroundings. Warm glowing LED light emits downward with its high performance, energy efficient, integrated LED light source at 3000K and 90 CRI. Ideal for a dining room table light, kitchen island light, living room light or conference room table light, Essence is available in either an Aged Brass finish with Bronze cable or Satin Nickel finish with Clear cable. Its dimensions are a thin .75″ high, 50″ long, and 7.5″ wide. Damp-rated and dimmable.